Of the four people that were injured during the explosion this afternoon, three were treated and released and one was admitted. That patient’s condition is listed as good. 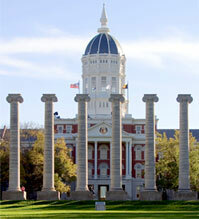 On Monday, between 2:15-2:20 p.m., an explosion occurred in Schweitzer Hall on the University of Missouri campus. Four people were injured and taken to University Hospital. The explosion, which is still being investigated, is believed to have been caused by a spontaneous combustion of gases including hydrogen and nitrogen that were being used in a research experiment. The building was occupied at the time of the explosion and it was evacuated. Schweitzer Hall is near the intersection of College and University Avenues and houses the university’s biochemistry department. The Columbia Fire Department is in charge of the incident; MU Campus Facilities and Environmental Health and Safety staff are continuing to investigate. Built in 1912, Schweitzer Hall was named after Paul Schweitzer, first full-time professor of Chemistry at MU.